Ingredients: Tomato puree (Water Tomato Paste, Citric Acid), Water, Ground Pepper, Crushed Red Pepper, Sugar, Granulated Garlic, Salt, Oregano, Thyme and Sodium Benzoate (as a preservative). Like many chileheads, when I find a hot sauce that I’ve never seen before, I buy it. I may or may not eat the sauce – but if it’s a label I haven’t seen before, I’m gonna buy it to at least put on my shelf. 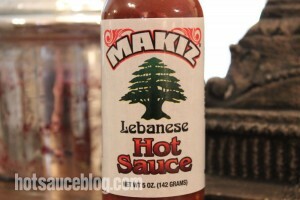 So when I happened across this Lebanese Hot sauce at the local Asian food market, it went in the cart before my wife knew what was going on. Lebanese Hot Sauce? Now this is something I’ve never seen before – and I was eager to try. But I didn’t know what to try this on – and Google wasn’t much help, beyond suggesting Falafels. 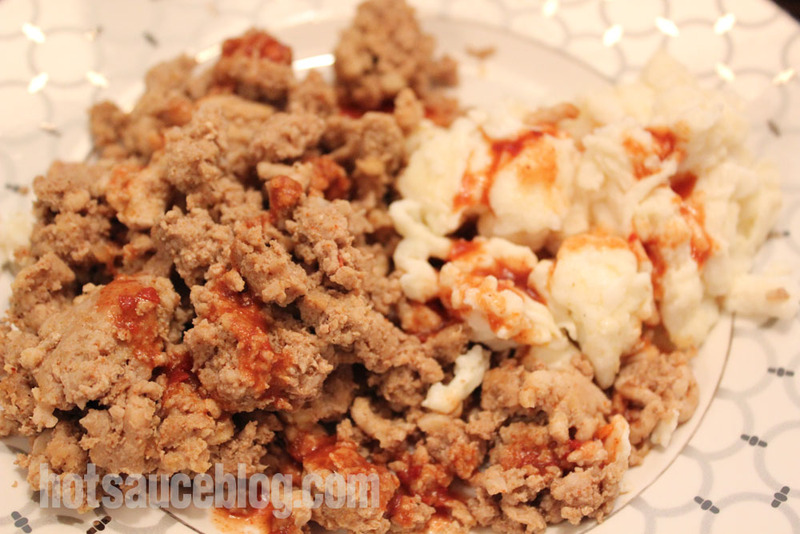 Fresh out of falafels, I decided to give this sauce a whirl on my standard breakfast – ground turkey and egg whites. This protein packed day starter always needs some flavor, so after opening the bottle and giving it a preliminary taste run, I poured it on. 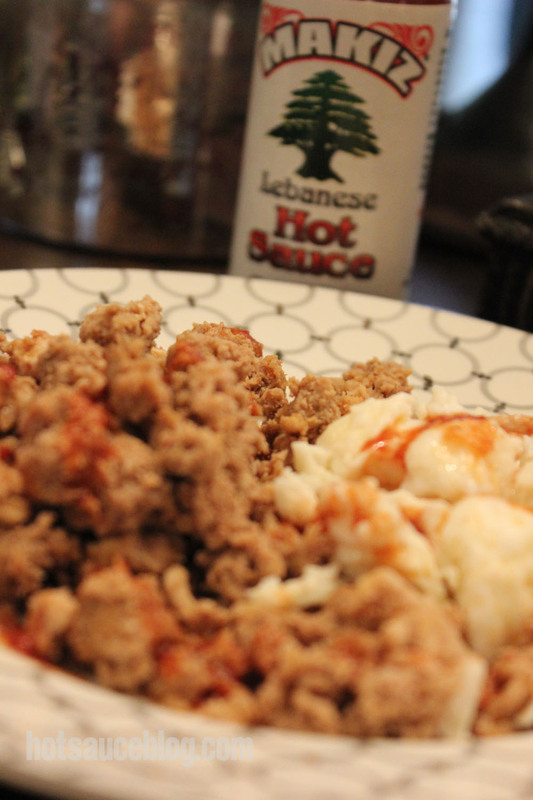 Yes, it’s not the prettiest dish in the world, but it’s a great hot sauce delivery system and it ensures you won’t be starving for lunch at 10am. 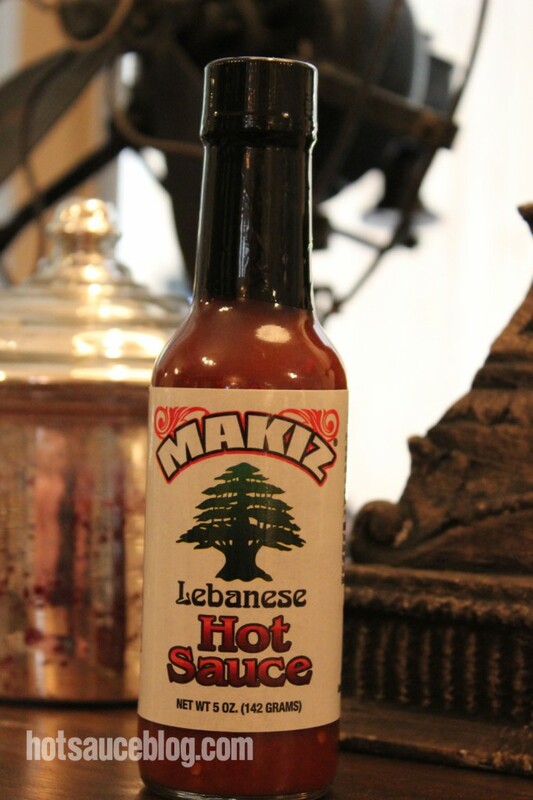 At first, I was worried about this Lebanese Hot Sauce – it smells like it contains extract but none are reported on the ingredients list. The sauce itself is very very thin, as you can see from the images – even after shaking it to ensure everything was properly mixed. On breakfast, the flavor of the sauce was muddied. I could detect a bit of heat – but I couldn’t call out any specific flavors. I decided to try the sauce straight to see what was going on with it. Straight on the tongue the sauce went and even then, the sauce still had a “muddy” flavor – due to the tomato paste/puree. The heat was more apparent when trying the sauce directly, but it didn’t stick around long and wasn’t much hotter then Tabasco, if you can imagine Tabasco without the vinegar hit. I think the biggest culprit behind the muddied taste could have been the age of this sauce – this could be quite old for all I know. Would I buy this again? Yes, I need a bottle on my shelf. Would I eat this again? Probably not directly on food – but I won’t throw this out. I’ll use the remaining sauce in a dish that calls for red pepper and tomato puree. I think it could be a great inclusion for a chili recipe – because ultimately, I couldn’t discern any “Lebanese” flavor from the sauce – it’s a slightly spicy tomato sauce. 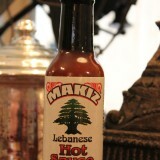 Makiz Lebanese hot sauce simply the best with a sweat spicy flavor and a hint of thyme .May be used on all foods .Available at Albertsons. You owe it to yourself to try it one time.